So, probably by now you've looked at the cover image and thought to yourself, "I don't give a damn what he has to say, this tape looks awesome". And actually that's a fair assessment, but just lend me a minute of your time to read on. Great news to follow. Yes, this impossibly obscure tape from the UK is indeed awesome. Ironically named, as what was once analog will now be presented to you digitally. Catchy minimal synth throughout, the kind that only the early 80s can deliver. What's even more exciting, however, is that Marc from Anna Logue Records has reached out to the artist and will be re-issuing this tape on LP! More info here. Update: this and more is now reissued through Vinyl On Demand in an amazing Scottish Minimal Synth compilation, more info here. A few quick notes: Track A7 here is not listed on the tape, it's just a 30 second instrumental bit at the end of the A-side. Also, the very last track "Trad. Arr." will not be making it to the re-issue, so that's a special treat in your download below. Enjoy! al robertson who's a part of this duet project later in '83 released his 7" vinyl 'green for go' under the name '100% manmade fibre' with that 'confusion' song. This album is just amazing, can anyone recommend anything similar. As far as my research suggests the artists on here didn't release any other music besides the "green for go" EP mentioned above. Anything similar to this would be awesome though. 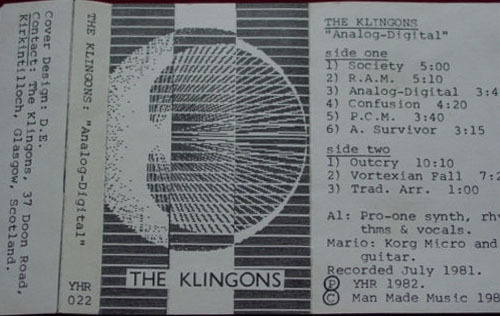 AL Robertson, as well as being 100%Manmade Fibre, was also involed in a group called Final Program who released a synth based 7" in the early 1980s (there's a song from it up on youtube) and a synth pop single with Liz Lochhead called 'Men Talk' in 1984 based on a poem of the same name by Liz Lochhead (the b-side is more synth based but isn't anything special. Al Robertson left Final Program in 1981 and wouldnt have been involved with the "Men Talk" single. Thanks for the information regarding Final Program. However the single with Liz Lochhead is labelled (on the sleeve) as 'Al Robertson with Liz Lochhead' and he is listed as the composer of the music. Obviously it may be a different musician of the same name and if this is the case, I apologise for my misunderstanding. Did you know the group at the time? I'm Alan McLean, a friend of the band at the time, particularly the other half of the partnership, Mario D'Agostino. 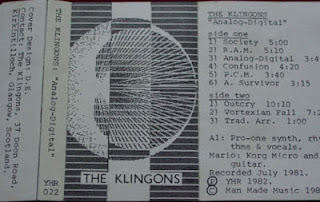 My role was to pass on tape loop techniques - orginating with Terry Riley (though he might tell you he got them from somewhere too) and I was also with Mario in a few side projects. I sometimes wonder what Al & Mario are up to. Oh! I should have said: played vocoder on a 'showcase' performance of 'Green for Go' at a club - meaning that we didn't do a set. Just that song. Al was more stylish than I was.